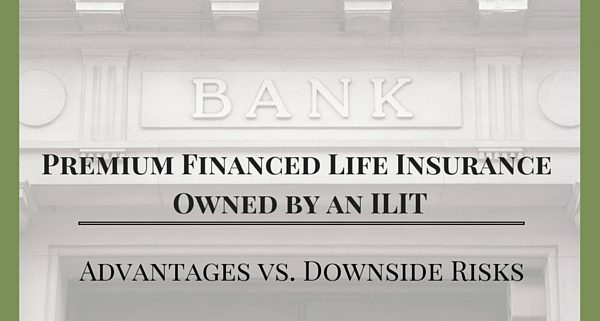 may desire to borrow money to pay large premiums for insurance owned by an ILIT to offset federal estate taxes. Often, these individuals can afford to gift premiums outright to the trust but, nevertheless, may choose to finance the premiums. •A relatively small increase in the interest rate charged on renewed premium financing may reduce the anticipated net benefit. This can happen when the original projection shows a policy crediting rate that exceeds the loan interest rate. •Leverage can be positive or negative. If the policy does not perform as originally projected or interest rates rise on the cumulative premium loans over time, there may be a financial train wreck in the future. •The lender has the ability to increase interest rates in the future as cumulative short term loans are rolled over. •If the lender decides not to make future loans as each short term period expires, the policy may lapse. 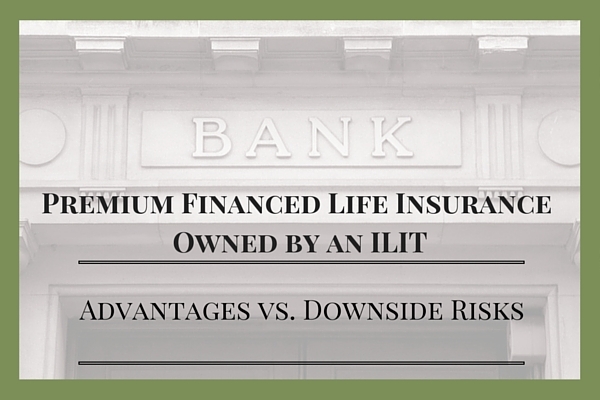 These potential disadvantages of the ILIT premium financing technique may cause even a wealthy person who is familiar with leveraged financial risk to pause and think twice about borrowing to pay insurance premiums. They may decide to simply make outright premium gifts to the ILIT allocating their lifetime gift exemptions on the Form 709 U.S. Gift Tax return. Keep in mind that the lifetime gift exemption for an individual in 2016 is $5,450,000 and $10,900,000 for a married couple. These lifetime gift tax exemption amounts can cover very large cumulative premiums over a period of time, and the lifetime gift exemption is indexed to inflation as well. Clearly, the bank wants to make sure that their position as lender is well covered by policy cash values, policy death benefits, and additional collateral for any shortfall in case the loan is terminated while the insured is still alive. And because the premium financing may last for a long period of time, until the insured dies, the bank will want to renegotiate the terms of the loan every 5-10 years. Interest rates can change dramatically over an extended period of time as we have witnessed the decline of interest rates over the last 20 years. What if there is an upward trend of interest rates over the next 20 years? This potential increasing interest rate environment will make premium financing plans very hard or impossible to sustain over that extended period of time. BSMG provides access to competitive single life and survivor life products and comprehensive insights into product design, risk appraisal, estate tax and income tax planning. We firmly believe that absolute clarity and a complete understanding by all parties is a prerequisite to reaching any conclusion about the merits and demerits of premium financing.